Fall is coming to a close, but I'm not giving up on amazing brown inks. One brown I always hear about is Diamine Ancient Copper, so let's take it for a spin. I purchased my bottle of ink from Cult Pens. 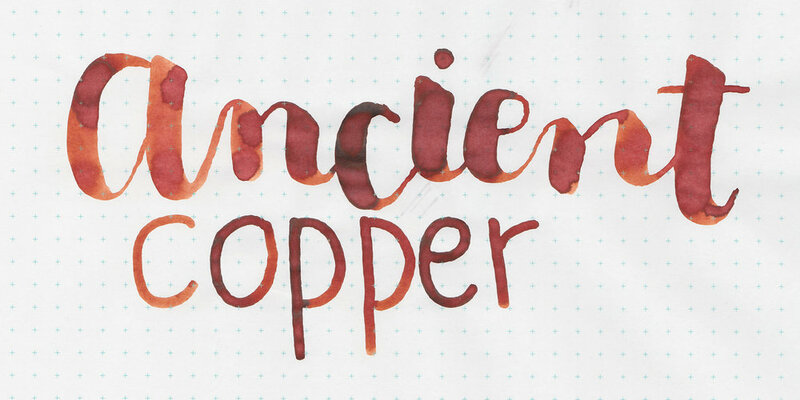 Ancient Copper is a red brown with shading and dark brown sheen. I've heard a lot of people talk about this ink in the past, but no one ever talks about the sheen. On Tomoe River you can really see the dark brown sheen. Bleeding: Low-there was just a little bit of bleeding in the flex nib on Tomoe River paper and Leuchtturm paper. Other properties: Medium shading, medium sheen (you can see the sheen in four nib sizes on Tomoe River, and in the flex nib on Rhodia and Leuchtturm). On 32 pound copy paper, the ink feathered just a tiny bit in the flex and broad nib, but did really well other than that. Ink swabs for comparison, left to right (top to bottom for mobile RSS): Diamine Autumn Oak, Diamine Ancient Copper, and Diamine Espresso. Click here to see the Diamine inks together. Diamine Golden Brown, Pelikan Edelstein Smoky Quartz, and Robert Oster Golden Brown. Click here to see the brown inks together. 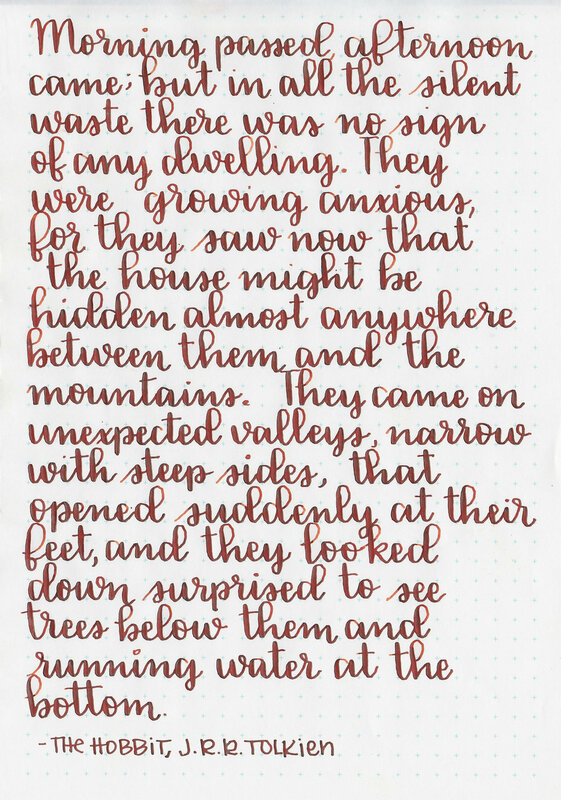 I used a Pelikan M400 White Tortoise with a vintage 400N nib on Tomoe River paper. The ink felt about average in flow, maybe just a tiny bit on the wet side. I love this ink/pen/paper combo. Overall, I really like this ink-it's a nice color, and has some nice shading and sheen. The ink is also really affordable, which I appreciate.